After three straight weeks of Octagon action, with the last two shows consisting of the freebie variety, the UFC takes a one-week hiatus to regroup. 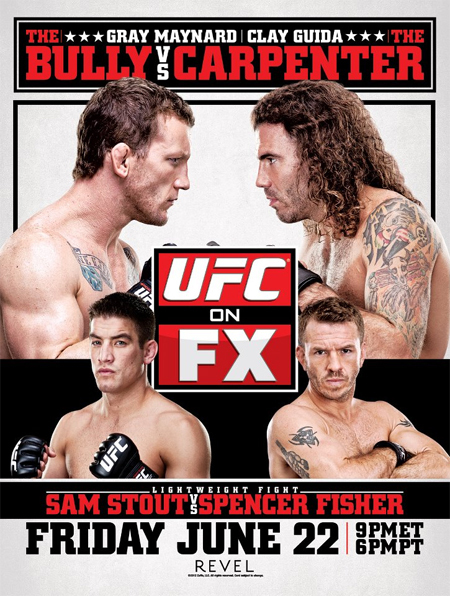 “UFC on FX: Maynard vs. Guida” picks up the baton on June 22nd. Revel in Atlantic City, New Jersey hosts the bash. The UFC’s Facebook page kicks things off by streaming a pair of prelims live at approximately 5PM ET/2PM PT. The company’s YouTube channel, which will also be made available right here on 5thRound.com, runs the two scraps, as well. FUEL TV airs six preliminary bouts live starting at 6PM ET/3PM PT. FX will then broadcast the main card live beginning at 9PM ET/6PM PT. A critical lightweight scrap with former top contender Gray Maynard and Clay Guida headlines the festivities. A lightweight shootout between Sam Stout and Spencer Fisher severs as the event’s co-featured contest.